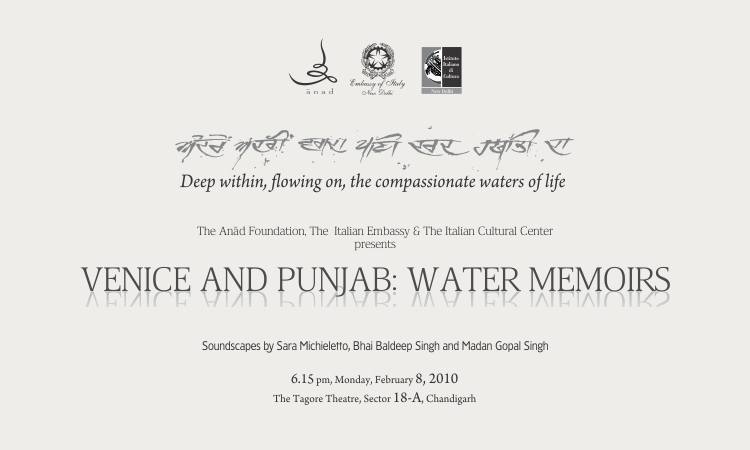 Taking water as a common theme or reference of their respective cultures, the artists will present some aspects of the artistic creativity of Italy, in particular instrumental music of the Venetian school of violin, and the cultural traditions of India, represented, in this program, by Sufi mystic songs and the percussion tradition of the Sultanpur Lodhi - Amritsari Baj from Punjab. Water, a universal example of simplicity and essentiality, is a symbol of life, of the flow of creativity, of freedom and penetrability of expression. Water is what makes Venice so different from many other beautiful cities, and what gave Punjab, in the geographical sense, its name, the land of the five rivers. With this program, while drawing everyone's attention on this very simple and very important element, the artists, though remaining in the ambit of their respective traditions, will try to find a way for a confluence of efforts and affinities.